As part of Apple's 10-K filing with the U.S. Securities and Exchange Commission, the company revealed that it has plans to open 30 to 35 additional Apple Stores by September 2013, a number almost identical to this year's retail growth. Apple opened 33 new brick-and-mortar stores during 2012, 28 of which were outside the U.S., bringing the total number of worldwide Apple Stores to 390. The company said in the filing that it plans to replicate 2012's growth by opening an additional 30 to 35 stores during the 2013 fiscal year, about three-quarters of which will be located outside the U.S. The company is making an international retail push, and is looking to bring the number of overseas Apple Stores more in line with those located in the U.S. As of September 2012, there were 250 active Apple Stores in the U.S. compared to 140 international locations. 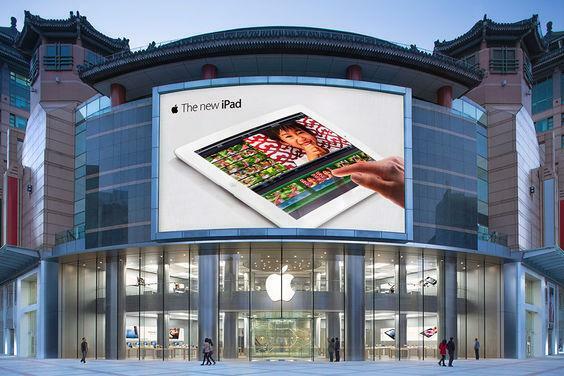 Most recently, the company opened the doors to its largest Asian outlet at the Wangfujing mall in Beijing, China. Despite not showing an increasing year-to-year growth rate, the new Apple Stores suggest the company's retail sector is enjoying steadily increasing sales. To that point, Apple said net sales for the segment increased $4.7 billion during 2012, a 33 percent increase from the year ago period. "The growth in net sales during 2012 was driven primarily by increased demand for iPhone following the launches of iPhone 4S and iPhone 5, strong demand for the new iPad and iPad 2, and higher Mac net sales," according to Apple's filing. For 2012, year-over-year growth in retail was down compared to Apple's other segments, accounting to 12 percent of total net sales, compared to 13 percent in 2011. Despite the decrease in retail's overall contribution to Apple's bottom line, per store performance was higher year-to-year, with each location garnering an average of $51.5 million in revenue compared to $43.3 million in 2011. While store revenues were up for the year, it was announced on Monday that Apple's Senior Vice President of Retail John Browett would be leaving the company after being on the job for less than one year. It is unclear how much of the Apple Store's recent success can be attributed to Browett, however the decision to let the executive go comes after a series of negative reports that cast a shadow on his tenure at Apple. The search for a suitable replacement is already underway, and CEO Tim Cook will be running the division in the interim.